Been holding off in hopes of a physical release, which is coming, but published by Nicalis so probably expensive and who knows if we'll ever see it in UK, but I digress. Works out cheaper if you buy from the south African store coming in at roughly £9.60 before any transaction/exchange fees. eshop-prices.com <--- Use this to compare prices of games across each region's e-shop. Boasting beautiful, hand-drawn animations and a re-orchestrated soundtrack, the cult classic returns with a unique blend of exploration, action and adventure! Cursed into a half-human, half-lizard monstrosity by the Meka-Dragon, you are in search of a cure! The only way you can return to human form is to find the Salamander Cross, a magical item with the power to remove curses. Play as the game’s classic character, Hu-Man, or as his brand new, long-awaited co-star Hu-Girl. You can also play as Lizard-Man, Mouse-Man, Piranha-Man, Lion-Man and Hawk-Man, and use their unique abilities to uncover the land’s deepest secrets. Enjoy three difficulty levels catering to players of all types, and switch from modern graphics and sound to 8-bit graphics and sound at any time – even during gameplay! It's impressive just how many games Nintendo have managed to get onto their eshop in such a short space of time. 1) side scrolling shovel knight type games (like this one). There are dozens of this type. 3) top down or isometric rpg's. Nintendo need to sort out their eshop prices too in my opinion. Wonder Boy has been reduced, but still too expensive for this type of game. Feels like a £5 game to me. £44.99 for the 'new release' LA Noire???? £49.99 for Doom??? This has always been the Nintendo way sadly. Digital prices are also always too high, even on other consoles. Absolute agree tho. Don't forget, cross compatible saves with the Master System! This is a great game. Well worth the money, the hand drawn animations look great. 1) Side scrolling, classic style, platformer a have been the bread and butter of Indies since they started. The fact that Nintendo fans, as a majority, live themselves a good platformer and you can't blame the indie devs for flooding the eshop. 2) You can blame Hamster for all the Neo Geo ports of 2D beat em ups. Without them there would be hardly any. 3) There is hardly any RPG's on the Switch at the moment. Off the top of my head I can think of I am Setsuna, Disgaea, Revenant Saga. 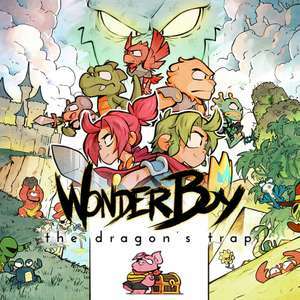 Wonder boy in no way looks like a £5 game. The art style and music is gorgeous. I do however agree that the £17.99 start price was much too high. The prices of the physical games on the eshop is standard across the industry and is in no way isolated to Nintendo. I agree about Doom and L.A. Noire being overpriced, but that's not Nintendo's fault, thats Bethesda and Rockstar taking the piss. The level of work that's gone into the art and soundtrack alone in this game justify it's price, granted it's a tad more expensive than it has been on other platforms (about £9 or so on PSN) but Switch tax is sadly here to stay for a little while longer yet. As for the type of games on the store, the vast majority are indie offerings, which, quite commonly fall into the categories you mentioned, largely because they're easier/cheaper to develop than fully realised 3D games and because larger developers have moved away from these genres allowing the indies to move in and fill the niche. Most of these same games are on other platforms too, though their stores have had much longer to get fleshed out. Give it time and there'll be more to your liking on the store. Morphite, Rogue Trooper, Thumper and Heroes of the Monkey Tavern are a few decent ones that spring to mind outside of the genres you listed. his *could* potentially be a brilliant game. I assume it is an updated version of Wonder Boy III The Dragons Trap on Sega Master System (it appears to be as the title/cover art alone with the same characters suggest so). Which incidentally is considered by many to be one of the best Sega games ever, and often features in peoples top 10 favourite games of all time lists. I loved the original game and will be very interested to see what has been done with this 3DS version. Typical that I bought this yesterday from the south African store.....oh well. It is a good game which I bought mainly for the nostalgia. I think about 10 quid is about right for this game. his *could* potentially be a brilliant game. I assume it is an updated …his *could* potentially be a brilliant game. I assume it is an updated version of Wonder Boy III The Dragons Trap on Sega Master System (it appears to be as the title/cover art alone with the same characters suggest so). Which incidentally is considered by many to be one of the best Sega games ever, and often features in peoples top 10 favourite games of all time lists. I loved the original game and will be very interested to see what has been done with this 3DS version. @Kingrat94 Oops minor detail that, holds hands up, was not paying attention to the detail. Think I just assumed was a 3DS game as it looks like one, and like it maybe should be? But in which case it being a Switch game, means I won't be playing it until after Xmas day, but will still get it. I agree about Doom and L.A. Noire being overpriced, but that's not …I agree about Doom and L.A. Noire being overpriced, but that's not Nintendo's fault, thats Bethesda and Rockstar taking the piss.The level of work that's gone into the art and soundtrack alone in this game justify it's price, granted it's a tad more expensive than it has been on other platforms (about £9 or so on PSN) but Switch tax is sadly here to stay for a little while longer yet.As for the type of games on the store, the vast majority are indie offerings, which, quite commonly fall into the categories you mentioned, largely because they're easier/cheaper to develop than fully realised 3D games and because larger developers have moved away from these genres allowing the indies to move in and fill the niche. Most of these same games are on other platforms too, though their stores have had much longer to get fleshed out. Give it time and there'll be more to your liking on the store. Morphite, Rogue Trooper, Thumper and Heroes of the Monkey Tavern are a few decent ones that spring to mind outside of the genres you listed. Fingers crossed this is the first of a few games on sale, ready for Black Friday / Cyber Monday. Reviews are pretty dire though for the switch version. I cancelled my …Reviews are pretty dire though for the switch version. I cancelled my pre-order. Sure you're not thinking of 'Rime'? I think OP is right, you're probably thinking of Tequila Works' RIME which received a (supposedly) horrible port to Switch this week. RIVE is by Two Tribes is s a sort of 90s platform shoots em up. There was a really good Wii U demo but the game got pushed back to Switch. I've been looking forward to it! I'm just relieved we were talking cross purposes! I thought for a second. Really Two Tribes? They messed it up? Noooooo! A little over £9.50 on the South African marketplace, for those that care. Nintendo allows publishers to set their own prices so they can't "sort out" the prices of anything but their own games. Nintendo allows publishers to set their own prices so they can't "sort …Nintendo allows publishers to set their own prices so they can't "sort out" the prices of anything but their own games. Pretty shocking really that gamers haven't realised it's been this way for at least 4 years now... Or they just prefer to continue blaming Nintendo.